When Back to the Future debuted in 1985, I was 18 and in between the end of high school and the start of college. 1955 – the past depicted in the movie – seemed so long ago that it might as well have been 1755. Now we’re in 2015 – the future shown in 1989’s Back to the Future Part II - and 1985 feels like yesterday. But not too old to enjoy these films, all repackaged for a 2015 “30th Anniversary Trilogy” Blu-ray set. For full information on the individual movies, please consult my reviews of those sets via the links above. Please note that the picture and sound grades found at the top of this article represent an average for the three discs. Though this article covers the trilogy as a whole, I want to concentrate mainly on the package’s final platter. Called “Bonus Disc”, it includes a few more Back to the Future tidbits. We open with a 2015 Message from Doc Brown. In this 45-second clip, Christopher Lloyd reprises his role as Doc to let us know we’re now in the future. It’s nice to have but not anything memorable. More new material shows up in Doc Brown Saves the World!, a short film. It lasts nine minutes, 38 seconds and gives us more from Lloyd as Doc attempts to prevent Armageddon from occurring in 2045. It incorporates the trilogy’s invented technology in clever ways and offers decent entertainment, though its social message seems heavy-handed. Next comes a featurette called Outatime: Restoring the DeLorean. In this 22-minute piece, we hear from film historian Rob Klein, DeLorean Construction Coordinator Michael Scheffe, co-writer/producer Bob Gale, restoration team members Mark Dehlinger, Joe Kovacs, Chad Schweitzer, Ed Hillery, Ken Kapalowski, Eddie Dennis, Ara Kourchians, Scott Miller and Sean Bishop, Universal Studios Hollywood Creative Director John Murdy, restoration head Joe Walser, restoration producer Terry Matalas, special effects supervisor Michael Lantieri, DeLorean Motor Company’s Danny Botkin, Film Threat’s Chris Gore, and actor Claudia Wells. The show details the creation of the movie’s original tricked-out DeLorean as well as its post-trilogy fate and restoration. I enjoy the discussion of the challenges involved in the restoration, but the featurette can seem more than a little self-explanatory at times. That leaves it as a mixed bag. 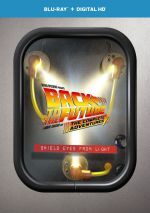 A 2009 program, Looking Back to the Future fills 45 minutes, 42 seconds with comments from Gale, Lloyd, writer/director Robert Zemeckis, production designer Rick Carter, cinematographer Dean Cundey, producer Neil Canton, 1st assistant camera Clyde Bryan, art director Todd Hallowell, editor Arthur Schmidt, executive producer Steven Spielberg, unit publicist Michael Klastorin, associate producer Steve Starkey, futurist John Bell, special effects supervisor Kevin Pike, animation supervisor Wes Takahashi, production designer Larry Paul, composer Alan Silvestri, editor Harry Keramidas, and actors Michael J. Fox, Lea Thompson, James Tolkan, Norm Alden, and Marc McClure. “Looking” examines story/character areas, casting and performances, the DeLorean, sets and production design, effects, music, and the film’s release. “Looking” becomes an engaging piece, though a lot of it seems redundant; we learn so much across the three movie discs that there’s not a ton of new info here. Still, it’s a tight little summary and worth a look. 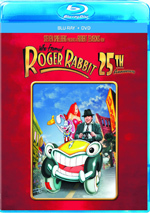 During 1991-92, CBS ran Back to the Future: The Animated Series, and the Blu-ray includes two episodes. We see “Brothers” (Season 1, Episode 1, 23 minutes, 24 seconds) and “Mac the Black” (Season 2, Episode 1, 23 minutes, eight seconds). Christopher Lloyd reprises his role as Doc Brown, but only for live-action bits that open/close the shows. For the animated parts, Dan Castellaneta plays Doc and does a pretty strong impersonation. Two actors do come back for the cartoon segments, though, as we get Mary Steenburgen as Clara and Thomas F. Wilson as various Tannens. David Kaufman plays Marty and does a credible job in the part. Maybe the other 24 episodes of The Animated Series offer entertainment, but “Brothers” and “Mac the Black” seem pretty lousy. They hyperactive and silly but they come without a lot of wit or cleverness. I’m happy to see these shows as a curiosity but I can’t imagine I’ll revisit them. The “Bonus Disc” concludes with some 2015 Commercials. We find promos for Jaws 19 (1:28) and a hoverboard (1:06). The latter seems annoying and doesn’t follow the approach it should, which is to sell the hoverboard to the little kids who use it in the movie. The Jaws 19 clip is more fun, especially since it synopsizes films five through 18. 30 years after its debut, Back to the Future continues to delight – and its two sequels offer good entertainment as well. They remain likable, charming action-comedies. The Blu-rays boast mostly solid picture and audio as well as a nice selection of supplements. If you don’t own the 2010 Blu-ray package, the 2015 release is the way to go: it adds new bonus materials and sells for a lower price. If you do already have the 2010 set, though, I can’t recommend a double dip. I like the “Bonus Disc” but it’s the only difference between the two and it’s not enough to warrant a repurchase. The 2015 set does nothing to change/improve the picture and audio from the 2010 discs – it simply repackages those earlier discs. 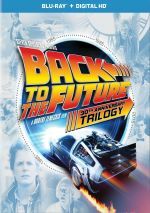 One other purse strings notice: in addition to this “basic” four-disc set, Universal also offers “The Complete Adventures”, a set that adds all 26 episodes of Back to the Future: The Animated Series, a 64-page book and unique packaging. This version retails for $99.98, or twice the cost of four-disc release. While the “Complete Adventures” sounds good, I can’t believe you get great value from that extra $50.